Until the blender can’t blend the makeup, my brush can’t swirl the powder, the bottle can’t set my face, and the tube can’t deliver concealing that is how long I use these products. I am always down for a good drugstore brand makeup. I prefer to use as many drugstore products during the work week as I possibly can. I’m applying makeup more times for work than going out on the weekends so I’d like to repurchase those products at a lower price. To be able to save my coins for a good amaretto sour or glass of red wine I’m here for. I have been on the search for nice face powder and I found that a lot of them have this red undertone that I do not have and I end up looking crazy. I have walked into Sephora and been on the website so many times and I’ll admit I wasn’t the Sephora collection a chance. No, like I was not entertaining it at all as in never looked at one product they made. Until I peeped, purchased, and put this on my face. Y’all I could not believe it, a powder that worked. The way this powder applies is crazy!!! It truly is smooth and blends with the skin perfectly. It’s definitely underrated when it comes to the advertising game but trying to purchase it can be a challenge at times. I have had to set email notifications of when they get more in stock. I am down to 1 and I know I need to go ahead and purchase a backup. I use 60 – Deep Ebony which is the deepest shade they have. I only wonder what would happen if they created more shades?!?! I know I wasn’t the only one who got sucked up in the campaign of using a Beauty Blender or consider your makeup application no good. I was right there purchasing a $20 sponge to apply my makeup to the point where I own at least 6. Now granted at times I lucked up and got a few discounted because I bought the cleaner with it but I think I’ve spent my fair share with these Beauty Blenders. In the back of my mind, I had a made a note to try and something that could come close if not match what the Beauty Blender was doing. I can admit they are amazing but again everyday work week makeup, spend less on products. So I’m in Target one day as I am whenever I drive by one or just want to be on the scene because it’s my favorite store and I found these blender sponges. I am over in the beauty section and I come across a two-pack that is more economical than purchasing just one. I got these home, tried them, and that same week I was back buying another twin pack. After using I started to read reviews and it was mixed opinions. I think if you are a Team Beauty Blender, you may have a harder time accepting the Sonia Kashuk Makeup Blender Sponge. As I said, I am looking to spend less so I was ready to try anything new. They get really BIG when dampened. This coconut water-infused spray is amazing. It is perfect for setting your makeup while also hydrating your skin. I like the way it sets the makeup so it doesn’t seem powdery but gives the look of a skin-like finish. It is hard to describe without it sounding bad but it leaves that ‘I have been wearing this makeup all day’ but in a good way. It is a 3-in-1 so it’s meant to prime, set, and refresh. I have set with it so far and it’s my favorite to date. 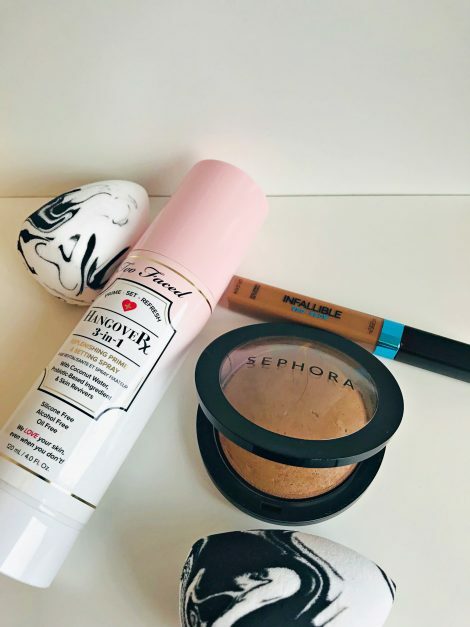 What are some of your current makeup favorites that you already know you will purchase again or definitely need a backup?